This year's Southwest Black Friday Sale and Cyber Monday Flight Deals are likely to offer massive discounts on flights and vacations. Check back for updated information! Southwest is offering discounts on domestic one-way flights for Cyber Monday. Find a few top routes below along with a link to the full-list of routes. For a full list of routes offered, visit Southwest’s Cyber Monday page. Purchase from November 26 through November 29, 2018, 11:59 p.m. in the respective time zone of the originating city. Continental U.S. travel valid December 10, 2018, through May 22, 2019. Travel to/from San Juan, Puerto Rico valid January 14 through February 28, 2019, and April 23 through May 16, 2019. International travel valid January 8 through March 6, 2019, and April 23 through May 16, 2019. Additionally, Southwest launched a three-day sale on Tuesday with tickets as cheap as $49. 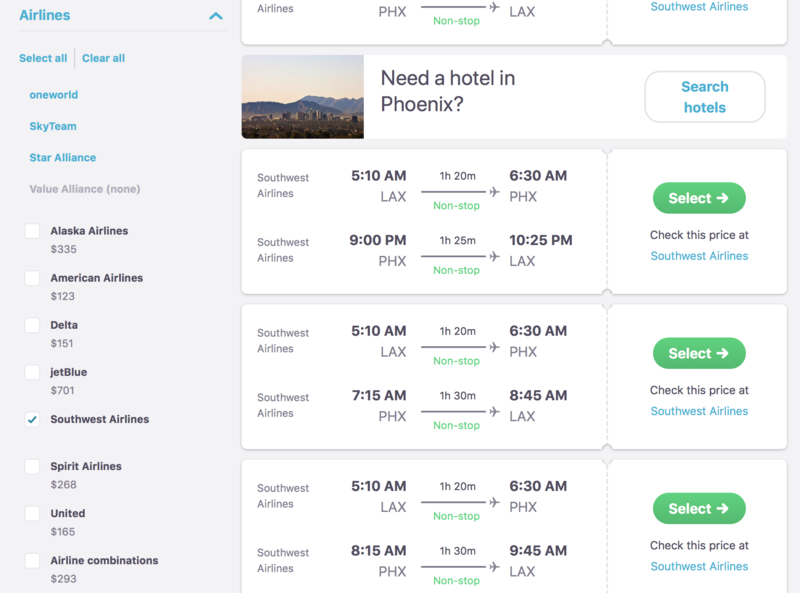 The airline’s early Black Friday fare sale has hundreds of discounted flights between December and May 2019. To get in on the deal, you’ll need to book by the end of the day on November 22(Thanksgiving). Search your desired destination and travel dates as usual, then scroll down the flight-results screen. On the left-hand side of the screen, you’ll find a section titled “Airlines”. Under “Airlines,” tap “clear all” and then select the box next to Southwest Airlines. Filter results to see all Southwest’s flights! Leading up to Black Friday, set a Price Alert online or on the app. When the flight you want drops in price on Black Friday/Cyber Monday, we’ll notify you to book! Be flexible and try searching from your home airport to “Everywhere”. Skyscanner will show you the cheapest destinations. Double-check baggage allowances and confirm that the deal is worth it once you consider the additional cost of baggage! Try searching for both one-way and roundtrip flights. One may be cheaper!